Hi all! My name is Chrissy. 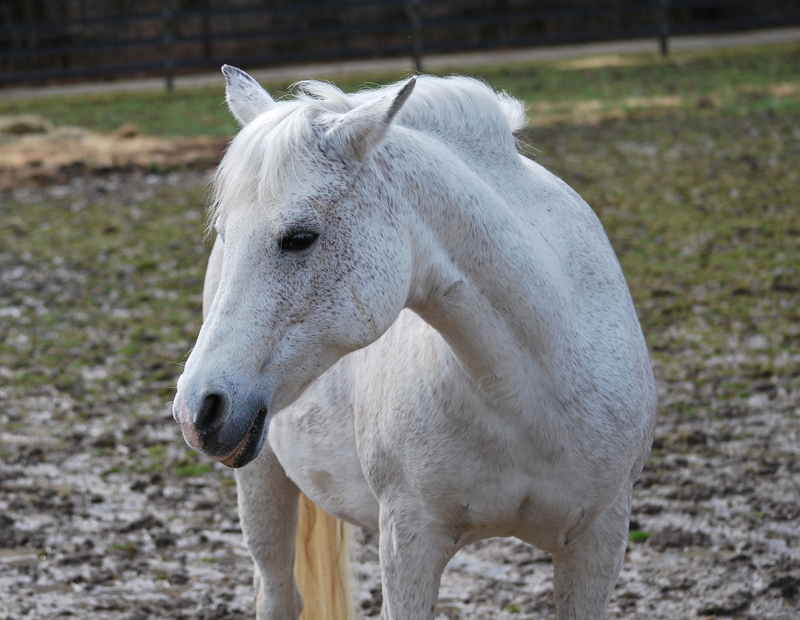 I am a gray Welsh/Arab mare. A petite little gal I am about 13.2 hands tall. Prior to arriving at Fieldstone Farm at the end of June 2010, I was a lesson pony at Ellrick Farm. Most of my life has been spent on the show circuit with kids. That was so much fun. I really shined in my younger days – it is hard to believe I was born in 1990 isn’t it? I think I look fabulous for my age! I guess it is from all the activity and great care I received thru the years. My donors, the Kehr family, really loved me. They wanted me to have a home where I could teach other kids as much as I taught their daughter. Fieldstone is a perfect fit for me to teach beginner off lead riders. I have a very smooth, steady and consistent trot. I respond very well to my rider’s cues. I actually prefer to be a more independent horse. I can teach more that way. All the activities in the ring are entertaining. Trail riding is lots of fun here, but I sure do enjoy the more one-on-one lessons. As perfect as I sound, I do have one flaw. I can be a little crabby when you are girthing me up. I may make a not so lady like face, but that is all. I am easy to lead, but may make a face at the trot. Just have to express my opinion once in a while. With my ‘cuteness’ factor as ‘high’ and my small stature, I am sure to be a favorite for lots and lots of grooming and ground lessons. I love to be groomed and could stand there all day! What lady doesn’t like to be the center of attention? I am anxious to meet you. I am sure I will see you soon.